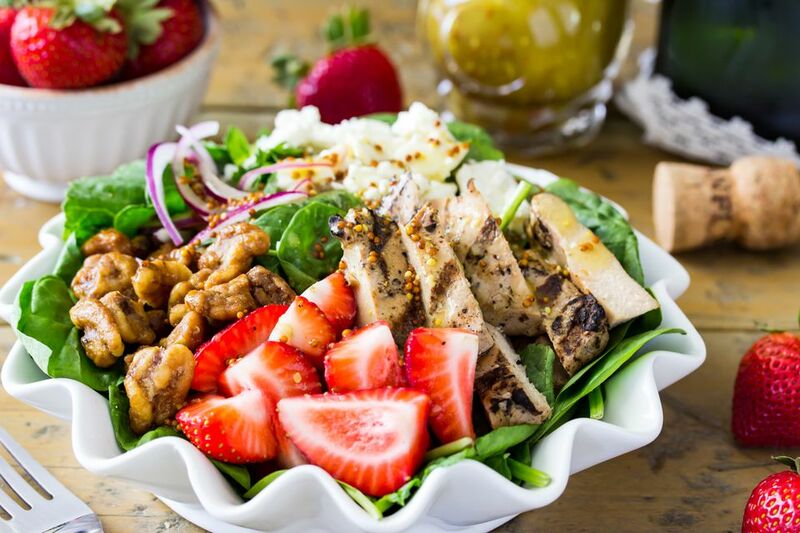 With fresh sweet strawberries, crisp candied walnuts, red onions, feta cheese, and sliced chicken breast served over a bed of greens, this salad is a perfect summertime (or anytime!) staple. It's light, refreshing, and becoming an increasingly popular salad. However, what really sets this particular strawberry chicken salad apart from the crowd is its champagne vinaigrette dressing. The dressing sounds fancy and tastes exquisite, but it's actually surprisingly simple to mix together and prepare. For best results, combine all ingredients in a mason jar or other container with a resealable lid, close the lid tightly, and shake well until all ingredients are well-combined. Alternatively, you could whisk everything together in a small bowl, but I like this mason jar method best. It also serves as a simple way to store any leftover dressing you might have (and cuts down on dishes, which is always a win!). Make sure you prepare the salad dressing first, as that gives it extra time for the flavors to really meld together. This strawberry chicken salad is great with pre-cooked or leftover chicken, or you can grill or bake chicken breasts specifically for this recipe, and instructions for doing so are included at the end of the recipe. Prepare the champagne dressing first by combining extra virgin olive oil, champagne vinegar, whole grain dijon mustard, lemon juice, honey, salt, pepper, and garlic powder in a mason jar with lid. Secure the lid tightly and shake well until all ingredients are well-combined. Refrigerate while you prepare your salad. If starting with uncooked chicken breast, prepare chicken by lightly brushing 3 chicken breasts with olive oil and sprinkling with salt and pepper. Place in a foil or parchment paper lined pan and bake on 350F for 25 minutes until internal temperature of chicken reaches 165F. Slice chicken into pieces. Rather than baking, the chicken breast may alternatively be grilled, but substituting boneless chicken breast. Combine chicken, quartered strawberries, walnuts, red onion, and feta cheese in a large bowl. Toss liberally. Top onto bed of mixed greens. Serve alongside champagne dressing - be sure to shake or whisk dressing well before serving, as ingredients will settle. Make a Perfect Simple Kale Salad... Then Dress It Up!